FIU students with an interest in Asian art know the work of Xu Bing through books or U.S. exhibits. For nine studying art and art history, however, meeting the famous Chinese artist in person during a study abroad was extraordinary. The program introduced students to contemporary art through the lens of history. It focused on current work while familiarizing students with the ancient traditions and age-old cultural sensibilities that still exert influence today. Excursions included trips to cultural and historic sites while also offering unprecedented access to the studios and homes of working artists. Students also gained a first-hand awareness of the key role tradition plays in contemporary Chinese art. Xu’s work, for example, invites people to consider how China can grapple with its own history, both ancient and modern, while moving forward. 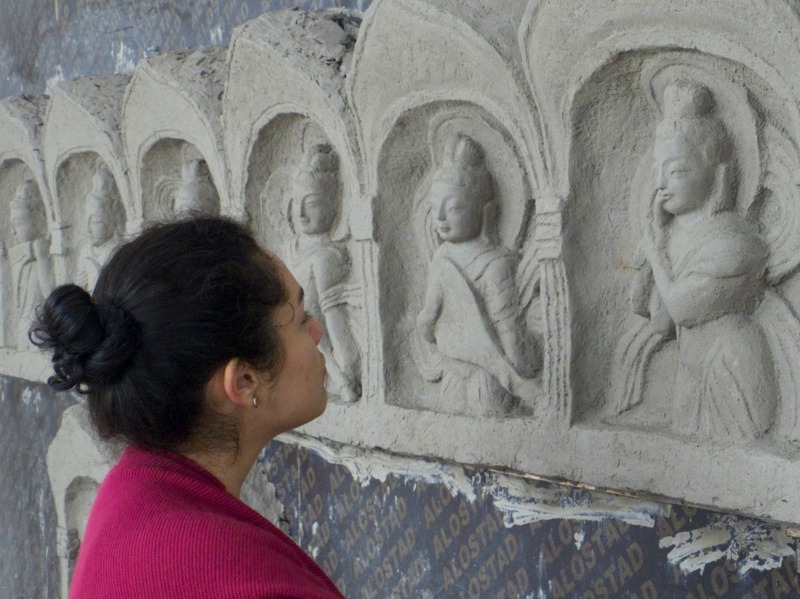 Banner and above: a visit to the Yungang Grottoes Research Institute. 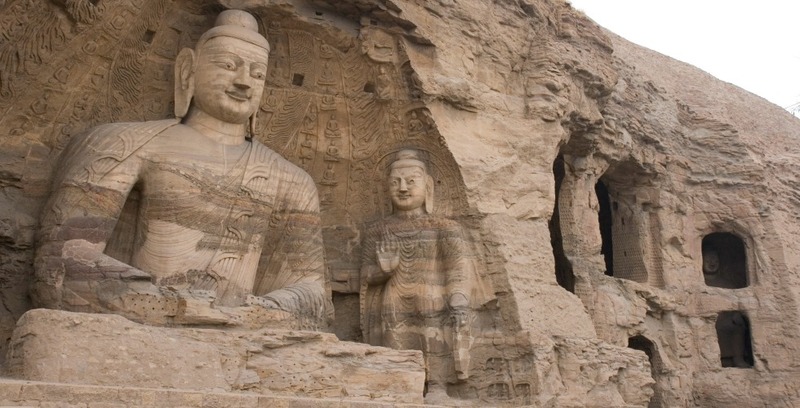 The Yungang Grottoes in China’s Shanxi Province feature stone carvings from the 5th and 6th centuries. Talking to the students, Xu drew a direct line from traditional landscapes to the inspiration for his work. Reverence for nature permeates the work of the early masters, he explained, and landscape painting – along with calligraphy, which is integral to China’s visual art – are seen as the rich apex of Chinese art. They embody the traditional virtues of Chinese culture. To understand those influences, students visited museums to see the celebrated landscape paintings from the Song and Ming dynasties as well as early Chinese bronzes. Along with art, students also visited historical sites, among them the archaeological digs in Xian that hold the Terracotta Warriors, the buried army of China’s first emperor dating to about 200 B.C. A high point of the trip was two days spent at the Yungang Grottoes, a religious shrine and World Heritage site near Datong. Buddhas as tall as 50 feet and exuberant stone carvings of thousands of smaller Buddhas dating from the fifth century attest to the arrival and influence of Buddhism in China. There, the students toured a section undergoing restoration and still off limits to the general public. Zhang Zhuo, director of the Yungang Grottoes Research Institute, sponsored the group’s two-night stay and held a seminar on the challenge of conserving the sacred site while also welcoming visitors. Karen-Janine Cohen is a fine art student with a focus in drawing and ceramics, and expects to graduate this year with a BFA.